If you are interested, simply press the contact button and email me, or call Carolyn at 336-918-8646. All puppies are $2900, which is the going rate for an Australian Labradoodle. They come spayed/neutered, microchipped, and with one/two sets of puppy shots. 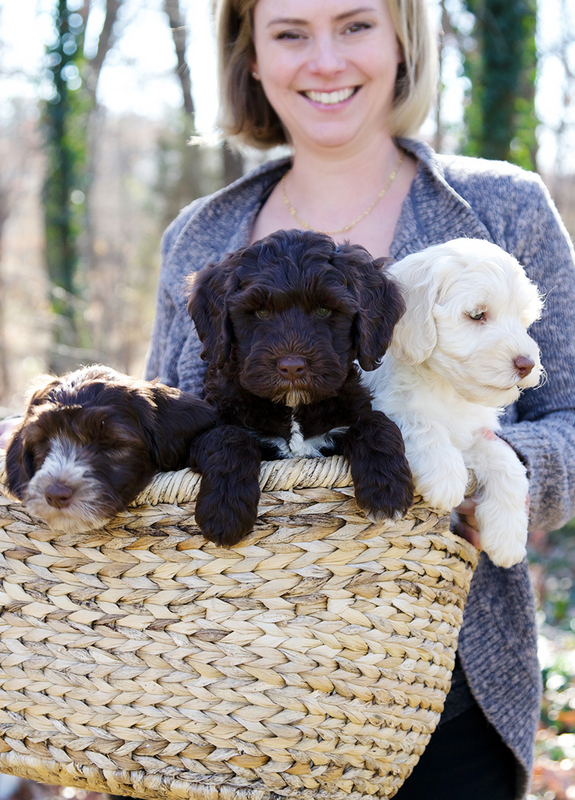 The puppies are registered with ALAA (Australian Labradoodle Association of American). Puppies also come with health guarantees and contracts. Puppies stay with me and my family on the farm for 9 weeks. I pour my heart and soul into the growth of these puppies both physically and emotionally. These weeks are critical times for a puppy to learn proper behavior, language, and manners from the pack, their mother, litter mates, and humans. During this time they are socialized with children, adults, farm animals, and car rides. I also use the crate training method to start potty training in the last couple of weeks. This is all done to insure that the puppies adjust well to their new homes, and make excellent family companions. Passing my scrutiny as a potential "forever home" in addition to a $500 deposit are necessary to be put on a wait list or purchase a puppy.